Crown Estate Scotland said on Wednesday it has “opened up” coastline, seabed and rural estates for local management under a new scheme. Scottish Crown Estate assets include seabed, just under half of Scotland’s foreshore and 37,000 ha of rural land across four estates. These are home to moorings, pontoons, fish farms, agricultural farms and more. “The scheme is an opportunity for organisations around Scotland, whether a small development trust or a local authority, to develop project proposals designed to improve the economic, social and environmental well-being of their local area using eligible Scottish Crown Estate assets,” said Crown Estate Scotland. Cabinet Secretary for the Environment, Climate Change and Land Reform, Roseanna Cunningham MSP said: “This pilot scheme paves the way for local authorities and local communities to actively manage land, coastline or seabed in a way that directly benefits communities, but also Scotland as a whole by, for example, promoting sustainable development. “Crown Estate Scotland has a wealth of expertise to share with local authorities and communities, and I look forward to seeing organisations develop and shape their proposed projects. Projects that “enhance economic, social, environmental and well-being outcomes” are welcome. 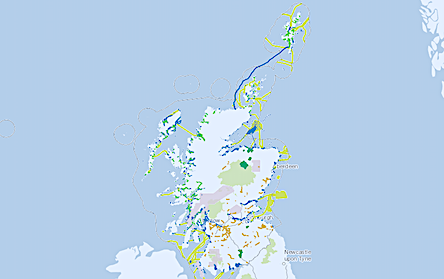 Crown Estate Scotland CEO Simon Hodge, said: “Connections to the land and the sea run deep in Scotland, and we see the opportunity to release potential benefits by involving local people in managing Scottish Crown Estate assets. “We’ve designed this scheme, with valuable input from a wide range of organisations. “It provides a great opportunity for communities and local authorities who have ideas on how they can increase the delivery of benefits from the Scottish Crown Estate. “We’re really keen to hear of innovative proposals that will use Crown Estate Scotland assets to enhance sustainable development in a way that has the support of local people and existing tenants. “If you have an idea, please come and speak to us. “Whatever the project, our staff will work with applicants, helping them to develop their plans. Successful applicants who go on to develop their proposed project may receive “appropriate remuneration” which will cover their expenses, and can, with agreement from Crown Estate Scotland, reinvest capital raised within the project. The balance of the revenue will be paid to Crown Estate Scotland which, in turn, is given to the Scottish Government to contribute to public spending. The Stage One Application process is open until August 16, 2018.